This quite remarkable two-seater, which included several novel and ingenious design features, was built in 1913 and was also known as the A.E.1, or Armed Experimental. It was conceived expressly to carry a Coventry Ordnance Works (COW) gun, which fired a one-pound shell, in an effort to provide the flying services with a weapon for which it was confidently expected there would be an eventual demand, although there was no immediate need. S J Waters appears to have had overall responsibility for the design, assisted by messrs Beadle, Folland, Reynolds and Swan. As was almost inevitable for a gun-carrier, the machine was a pusher, power being provided by a water-cooled, six-cylinder in-line Chenu engine of 100hp. This was mounted well forward in the nacelle so that, in the event of a crash, there was no risk of it breaking free and crushing the pilot, a common failing of most pushers. A shaft extended rearwards from the engine along the bottom of the nacelle, driving the propeller via a chain running in an oil-tight case behind the pilot's seat. In an attempt to eliminate the drag of the braced tailbooms normally associated with pusher designs, the tailplane was carried on the end of a single tailboom which was supported on bearings at the end of the propeller shaft and by bracing wires running to the upper wing and to the undercarriage. Surviving drawings suggests that there was some indecision as to how the fully enclosed engine was to be cooled. At least one drawing shows extensive surface radiators along the top of the nacelle, following its contour from nose to cockpit rim. However, as finally built, the forward portion of the nacelle was clad in aluminium sheet, over a framework of steel tube, and the remainder was clad in plywood. The radiators were mounted inside the nacelle, cooling air being admitted through a circular hole in the nose. The wing and tail surfaces were of entirely conventional construction, being of fabric covered spruce, and their design clearly owed a great deal to the contemporary F.E.2, as did the undercarriage. Test flying, undertaken by Geoffrey de Havilland, assisted by Ronald Kemp, revealed that the tail was not sufficiently rigid for satisfactory service, and the tests were discontinued without the gun being fired in flight. It was, however, tested with the machine suspended from the roof of one of the Farnborough airship sheds to establish that the gun's recoil would not pose a problem in flight. The F.E.3's eventual fate is not recorded, but it is possible that rather more than the lessons learned from its trials was incorporated in its successor, the F.E.6. Weights: 1,400lb (empty); 2,080lb (loaded). Designed early in 1914, the F.E.6 continued to explore the ideas previously incorporated in the F.E.3 and, like its predecessor, carried a one-pounder quick-firing Coventry Ordnance Works gun. It closely followed the layout of the earlier machine and was again a pusher, but, being a slightly heavier design, it was powered by the more powerful 120hp six-cylinder Austro-Daimler. The wings were standard R.E.5 components, and the tall oleo undercarriage incorporated a small nose wheel, making it very similar in appearance to that of the F.E.2b. The tail surfaces, like those of the F.E.3, were carried at the end of a single tubular tailboom attached to a bearing on the end of the propeller shaft. Unlike the boom of the earlier machine, this one was a cantilever structure, with no bracing wires to support it. The control wires operating the rudder and elevators were run inside the tailboom tube, thus eliminating another potential source of drag. The F.E.6's fin and rudder, in common with those of many of its contemporaries, appear to have been of insufficient area to balance the keel area forward of the centre of gravity. This may have been one of the reasons why its flying career, at the hands of Frank Goodden, was very brief. Following a test flight on 14 November 1914, a heavy landing resulted in some damage to the undercarriage, but the aircraft was not repaired. Instead the machine was broken up, the wings being returned to store as R.E.5 spares. As with the F.E.3, it is extremely doubtful if the gun was ever fired, at least not while the machine was in flight. F.E.3. The F.E.3 was a remarkable aeroplane, especially so as it was built as early as 1913. The tail was carried on a single boom, which passed through the hollow airscrew shaft, and the armament was a 1-pounder Coventry Ordnance Works gun. This gun was apparently never fired from the aircraft in flight but was tested in the summer of 1913 with the F.E.3 suspended by ropes from a gantry. It was established that flight stability would not be unduly affected. F.E.6. 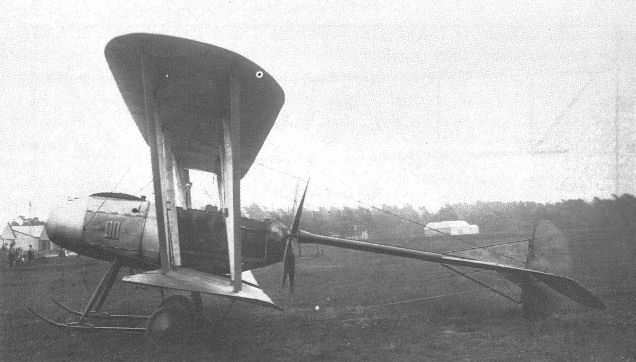 This two-seat pusher fighter was built in 1914 as a development of the F.E.3 theme and was similarly armed with a Coventry Ordnance Works 1-pounder gun. This was (or was to be) installed on a pillar mounting in the nose. This machine was a two-seater pusher designed, under the leadership of S.J. Waters, to carry a one-pounder COW gun. The testing, by de Havilland and Kemp, revealed the inadequate rigidity of the tail and flying was abandoned. The effect of the recoil of the gun was assessed with the machine suspended from a hangar roof. The water-cooled engine was mounted at the front of the nacelle and drove a four-bladed propeller through a shaft and enclosed chain. A circular air intake in the nose provided air to a radiator in front of the crew, the air escaping through louvered panels in the sides. The tail unit was mounted on a single tubular boom, with a support for the extension shaft behind the propeller, the tail itself being braced by wires to the wings and undercarriage. Triangular fins, above and below the boom, formed a post for the tall rudder; a large semicircular tailplane and divided elevators completed the tail unit. The wings were of unequal span, with the top overhang braced by struts. Lateral control was by warping. Tests of the machine, which was built in 1913, were not continued, but a successor of the same general configuration followed in 1914. Power: 100hp Chenu six-cylinder inline water-cooled. The FE.6 was designed and built in 1914 as a successor to the FE.3, to carry on the work of investigating the requirements for the carnage of the one pounder COW gun. Frank Goodden flew the aircraft on 14 November 1914 for the first time, but the flight resulted in damage which, although not severe, was not repaired, indicating problems of a more fundamental nature. The aircraft was a heavier and larger version of the FE.3 and was of the same basic layout. The tail boom was more substantial and was not braced externally, and had space to run the tail surface controls internally. The boom would, of necessity, have been firmly anchored back to the structure of the aircraft. The gun was mounted above the lip of the front cockpit to fire forward, but was probably never actually fired. The F.E.3, known also as the A.E.1, was an experimental two-seat pusher gun-carrier built by the Royal Aircraft Factory in 1913. The propeller revolved around the single metal tubular boom which was intended later to be the sole support for the tail unit. The 80 h.p. Chenu engine was cooled through the circular opening in the nose of the nacelle. The F.E.3 was used for armament trials during the summer of 1913, equipped with the 1 1/2- pounder C.O.W. gun which fired through the nose opening. Span, 48 ft. Length, 33 ft. Wing area. 480 sq. ft. Weight loaded. 2,100 lb. Maximum speed, 75 m.p.h. Climb, 350 ft./min. Ceiling, 5,000 ft. Located at Farnborough and engaged primarily in aeronautical research, the Royal Aircraft Factory (so named in April 1912) was responsible for the design and development of a number of warplanes during World War I. In accordance with the factory’s purpose they received designations combining a prefix letter (at first indicating the general configuration, but later the role) with E for experimental (although several, such as the B.E.2, F.E.2, R.E.8 and S.E.5, were to be built in large numbers). Built in 1913, the F.E.3 was thus the third design in the “Farman Experimental” series of pusher biplanes, and was designed to carry a COW one-pounder quick-firing gun. 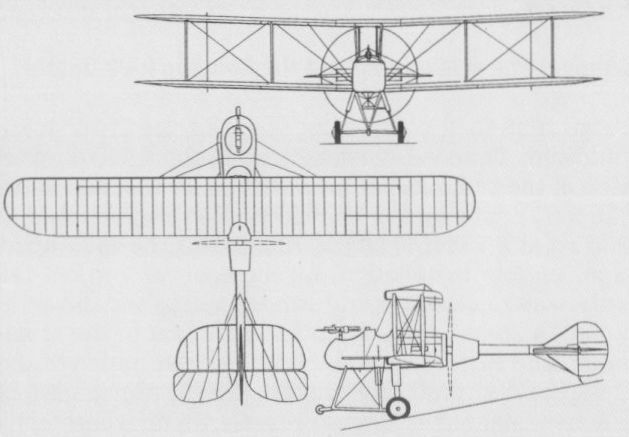 Alternatively known as the A.E.I (“Armoured Experimental”), the two-seat F.E.3 was a two-bay biplane with overhanging upper wing, and a four-bladed pusher propeller driven by a shaft and chain from the 100 hp Chenu eight-cylinder water-cooled inline engine mounted in the front of the fuselage. The large cruciform tail unit was carried on a single central boom secured through the hollow propeller shaft and braced by wires to the upper wing and the undercarriage. Flight tests showed that the tail attachment was not sufficiently rigid and the gun, fitted in front of the fuselage, was fired only in static tests at Farnborough after flight testing was abandoned. The F.E.3 used fabric-covered wooden construction for the wings and tail unit, but the fuselage nacelle was of steel tube construction with aluminium and plywood skinning. A large central orifice in the nose took in air for the engine radiators, which were inside the nacelle. Max speed, 75 mph (121 km/h) at sea level. Initial climb, 350 ft/min (1,78 m/sec). Service ceiling, 5,000 ft (1525 m). Empty weight, 1,400 lb (635 kg). Loaded weight, 2,080 lb (943 kg). Span, 40 ft 0 in (12,19m). Length, 29 ft 3 in (8,91m). Height, 11 ft 3 in (3,43 m). Wing area, 436.5 sq ft (40,55 m2). Of similar construction to the F.E.3, the F.E.6 was built in 1914 and was powered by a 120 hp Austro-Daimler six-cylinder water-cooled engine. 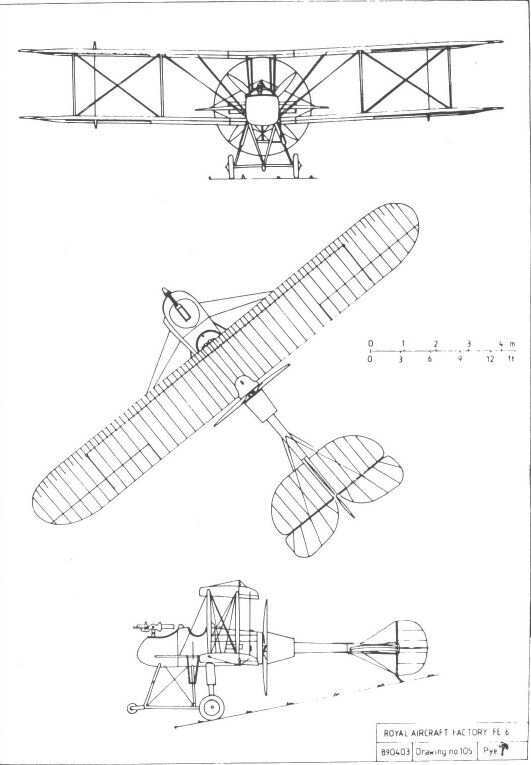 Standard R.E.5 components were used for the wings, which were of equi-span, and the tail unit was carried on a cantilever boom, without bracing wires. The F.E.6 was flown at Farnborough on 14 November 1914 but this may have been its only flight, and, if fitted, the COW gun that it was designed to carry was not fired. Empty weight, 2,000 lb (907 kg). Loaded weight, 2,630 lb (1193 kg). Span, 49 ft 4 in (15,03 m). Length, 29 ft 6 in (8,99 m). Height, 15 ft 0 in (4,57 m). Wing area, 542 sq ft (50,35 m2). As with many aeroplanes of its time, the F.E.3's streamlined appearance was rather marred by the heavy undercarriage considered necessary to cope with unprepared aerodromes. RAF FE.3 originally AE.l (Armed Experimental) built in 1913 was soon abandoned. The innovative F.E.3, showing its single tailboom and the nose aperture which admitted air to the internally mounted radiator. 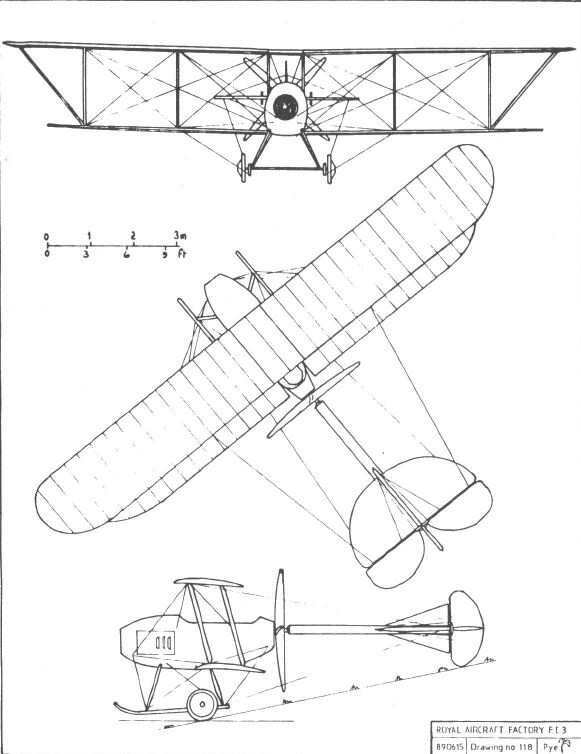 The F.E.3. The opening in the nose admitted cooling air to its internally mounted radiators. RAF FE.6 with the same one-pounder COW gun as FE.3 was built in 1914 but was also fundamentally unsound. The F.E.6 was a derivative of the F.E.3.